The HAT Assay Kit is a fluorescent method to assay samples for histone acetyltransferase (HAT) activity or to screen HAT inhibitors. The assay is easy to use, features a simple protocol that gives you results in 30 minutes and is ideal for high-throughput usage in 96-well plates. The HAT Assay Kit includes enough recombinant human p300 to screen 96 wells of inhibitor compounds, and anacardic acid is included for use as a control, as it is a potent HAT inhibitor. All assay buffers have been thoroughly tested to ensure that no components interfere with either activity or inhibition assays. Histone H3 and Histone H4 N-terminal peptides are included as HAT substrates, so you can use the one best suited for your HAT enzyme. 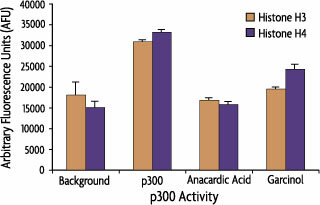 Figure 1: p300 activity and inhibition. The HAT activity of 50 ng of p300 was assayed with 50 µM acetyl-CoA and either 50 µM Histone H3 or Histone H4 peptide as the substrate. Activity was inhibited with 15 µM anacardic acid or 25 µM garcinol.